WinX HD Video Converter Deluxe, professional HD video converting software, recently has made its upgrade and comes out with a brand new feature – photo slideshow making that allows users to put different photos into a slideshow for automatically playing. The photo slideshow making feature newly added to WinX HD Video Converter Deluxe is useful. It allows users to combine photos and images into an entire slideshow as a video in popular MP4, AVI, FLV, etc, make it playable on iPhone 5S/5C/5/4S, iPad 4/Mini/3, iPod, WP8, Samsung, HTC, Android mobiles, Nokia, Xbox, PSP etc. It also allows users to add background music into the photo slideshow, and set an ascending or descending playing order. How to Make a Photo Slideshow with WinX HD Video Converter Deluxe? 1. Load photo folder by clicking 'Photo' button. 2. 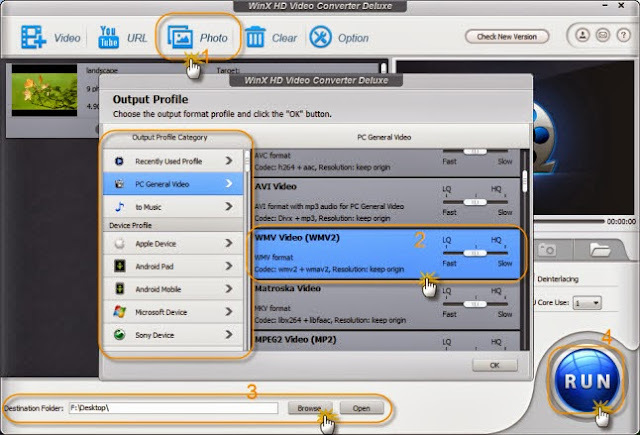 Choose a video profile under output profile category for the output slideshow, for example, the general WMV format video. 3. Select a folder for the output slideshow by clicking 'Browse' or 'Open' button. 4. Click 'RUN' to start combining photos in the folder input to the program to a slideshow as a WMV video. Before starting combining, users can click 'Edit' button to set photo ascending/descending playing order, playing interval, and so on. Users can also click 'Rename' to add target name and tag information. Users will find the slideshow function useful and easy to operate after giving a try on WinX HD Video Converter Deluxe. All-in-one HD video converter, video editor, YouTube video downloader, and photo slideshow creator. It can convert between all mainstream video formats like MKV, M2TS, MTS, AVCHD, MOD, AVI, MP4, MOV, and FLV; convert videos to mobile devices like iPhone 5C/5S/5/4S, iPad 4/Mini/3, Samsung Galaxy S 4, HTC New One, WP8, etc. ; edit, trim, crop, merge videos before converting; download music videos from YouTube, Metacafe and Dailymotion; and make slideshows very easily.